He may now be a man of leisure keeping busy on the crown green or at the local heavy horse centre but The Boy Andy remains determined to hit each and every cafe. Nearing 4pm on (what for some of us remains) a working Wednesday and a message arrives proposing a possible meet-up in the west Ipswich locale. Calls are made, cycles are ridden and we're strolling along past the Towers of Cumberland along the multicultural Norwich Road. 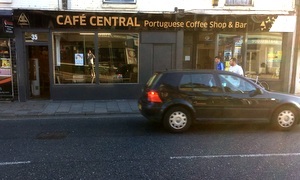 More or less opposite what was previously O Portugues but is now the thriving Bicafe stands, waddya know, a similarly wide Portuguese coffee shop called Cafe Central. With memories of long-gone Frangipani, there appears to be more than one door. Like Donna Noble, we turn left. Not entirely sure what's on offer, we like the look of Ucal "leite com chocolate" in a glass bottle. May as well partake of that cake there and that cake there too, please, senhor. Table by the window to watch the sweet folk of the town pass by. Big telly's showing athletics, noisy kids are running around and there's a bunch of fellas drinking beer. We're so at home. Cake the first, a sugary delight. Cake the second, more savoury than sweet, truth be told. Choccy milkshake consumed -- ah! -- back goes Andy for a pair of tiny coffees. Zing! Now the hairs on my chest have their very own hairs. Screen on the wall switches to cycling, we're bouncing off the walls and time to leave the vibrant Iberian community behind. If it was a car -- PORTARO. If they were passing by -- Nelly Furtado.